The beginning and end of this show (especially the end) is what really matters. The theme music for this show gets your emotions bubbling and it truly is exciting. At the end of the show the theme slows down a little and allows you to watch and be amazed at the spectacle of sorcerer mickey at the top of the mountain creating a fireworks display which is awe inspiring. The use of trap doors in this show is fascinating and creates the illusion that mickey is appearing out of nowhere. You really will believe in magic. Bring the kids to this show and give them the same incredible Disney experience you had when you were young. Most AMAZING shoiw I have ever scene! Makes you truley believe in magic again just for a second. And it's a pretty long show however it flies by! LOVE IT!!!!!! The person who said good but not that good doesn't believe in Disney magic. This is one of the best shows put together by Disney. You should have done the fantastic dinner package this would have saved you the wait. Fantasmic is a great show, but its worth waiting an hour and a half before show time for. At least with rides the Queue offers some form of entertainment. Even then if the wait is over 20 minutes I move on. Fantasmic is a large scale theatrical stage show at Disney's Hollywood Studios, featuring music, lasers, lights, fountains, fireworks and live performers. Mickey and friends fight a night-time battle against Disney's most villainous Characters. The music, pyrotechnics, stunts, water-bound floats, and laser-projected images will keep you spellbound! Theater: Guests can view the show in a new amphitheater located behind The Twilight Zone Tower of Terror™ and off Sunset Boulevard. Encircling a newly created waterway and island, the theater can accommodate 6,900 seated guests and 3,000 standing guests. Description: "Fantasmic!" --an all-new festival of lasers, lights, dancing fountains, and dazzling special effects -- lights the skies of Disney-MGM Studios. The show takes Guests inside the dreams of Mickey Mouse -- into a world where magic creates dancing waters, shooting comets, animated fountains, swirling stars, balls of fire, and other amazing wonders. When Disney villains intrude on Mickey's fantasy and turn his dreams into nightmares, he uses the power of good to triumph over the evildoers. The enchanting performance is synchronized to the melodies of favorite Disney classics such as "Pocahontas," "Fantasia," and "The Lion King." 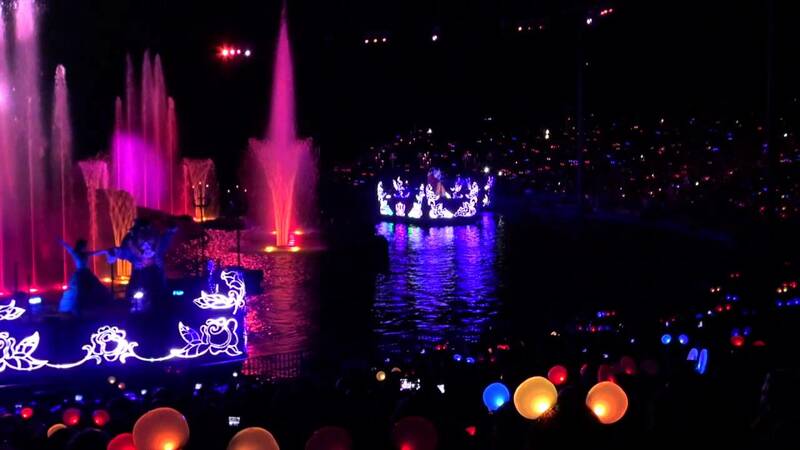 • The moat surrounding the show contains approximately 1.9 million gallons of water. • Steamboat Willie is 80 feet long with a 16-foot beam and weighs approximately 70,000 pounds. • Each performance of Fantasmic! uses three mist screens that atomize 800 gallons of water per minute. • There are 350 lights some of which are being used for very first time in a live Walt Disney World Resort® Entertainment show. • The fire-breathing dragon rises 50 feet into the air and has a wingspan of 50 feet. • The mountain stands approximately 57.5 feet above the water. • The cast of live performers includes 46 cast members filling 78 costumes. The 25-minute spectacular "Fantasmic!" features 50 performers and combines dazzling special effects, colorful pyrotechnic explosions, beloved Disney characters, animation and dancing waters synchronized to the melodies of timeless Disney classics. The presentation lights up the sky nightly above a new 6,500-seat amphitheater behind The Twilight Zone Tower of Terror off Sunset Boulevard. The specially designed amphitheater also can accommodate 2,500 standing guests. "Fantasmic!" premiered at Disneyland in California in 1992. The Disney-MGM Studios production features many new show elements and incorporates scenes from recent animated releases such as "The Lion King," "Pocahontas," "Hercules" and "Mulan." "Fantasmic!" is presented nightly with performance times varying based on park hours.